These rainbow fruit pops look almost too good to eat....almost. Layered with frozen fruits, this is one tasty and healthy dessert recipe. 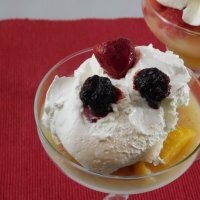 The recipe calls for strawberries, kiwi and peaches, but you can use any fruits you like. These frozen treats can keep you cool but not ruin your diet. By using a sugar substitute there are zero Weight Watchers Points as the fruits are freebies on all of the plans including the new FreeStyle SmartPoints. If you are not a Weight Watchers member, then you will be glad to hear there are only 52 calories in this sweet treat. So you won't be blowing your diet. Make up a double batch to have some another day. These take a bit of time to make but look so delicious when they are done. The layered frozen fruit makes this sweet treat a colorful display. 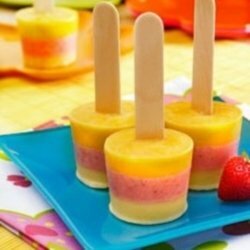 Kids and adults will love to cool down this summer with these fruit pops. In a blender or food processor, puree strawberries with 1 tablespoon Truvia sugar substitute. Divide mixture evenly between 12 cups or popsicle molds. Freeze until firm, about 30 minutes. Meanwhile, rinse processor; puree kiwi fruit with 1 tablespoon Truvia sugar substitute. When strawberry layer is firm, pour kiwi fruit puree into molds. Puree the peaches with 1 tablespoon of Truvia sugar substitute. When the kiwi layer is frozen and firm, pour the peach layer into the molds and freeze until firm. Pull out of the freezer when ready to serve. The nutrition for the fruits were not included when calculating any of the Weight Watchers Points. If you don't have a mold to make these rainbow fruit pops, use small paper cups to create this recipe. 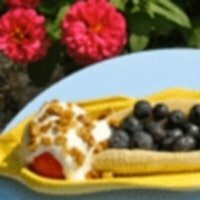 You can use any fruit you like without changing the WW Points. This is another tasty way to cool down on those hot days. With only 1 WW Freestyle SmartPoint you will want seconds. This is a tasty way to get your fruits in for the day. 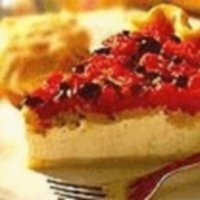 It's so yummy you will feel like you are cheating on your diet. 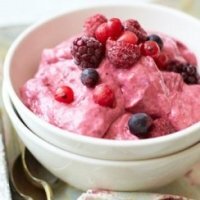 Make it a frozen fruit frenzy day with this delicious dessert recipe. This one is only 1 WW Freestyle SmartPoint. 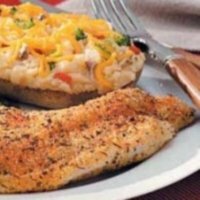 If you are a fish lover, then this Cajun Catfish Recipe is perfect for you and has only 2 Freestyle SmartPoints. 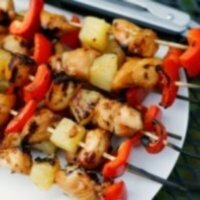 Grab the skewers, fire up the grill and try these turkey pineapple kabobs as an appetizer or make it the main course. This is not your typical quiche recipe. With flavors from basil, the juicy tomatoes and egg mixture this makes a great hot breakfast. If you are looking for a healthy way to start your meal, then browse these healthy appetizer recipes. You can choose from different ethnic foods and ingredients. Have you ever wondered what makes up the calories in your foods. Then check out this article to see how the macronutritients fats, protein and carbs impact the total calories. Do you spend hours doing 100 crunches and abdominal exercises without seeing the results you want? Then read this article to see what it really takes to lose belly fat.